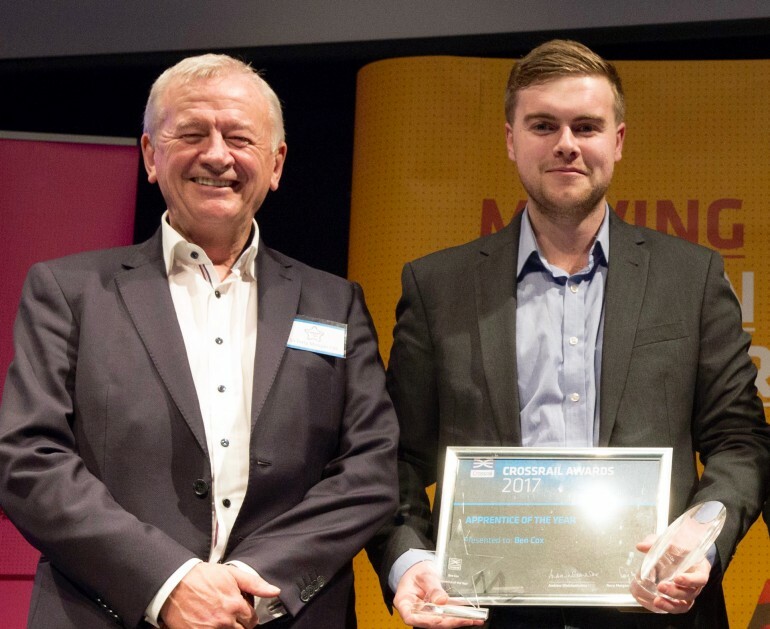 Apprentices celebrated at Crossrail’s annual awards - Crossrail . For information about the Elizabeth line please visit the Transport for London website. Ben received the top award for his unwavering enthusiasm and total commitment to quality assurance and safety. Ben is undertaking a Level 3 Infrastructure and Civil Engineering apprenticeship at Crossrail’s Stepney Green site with contractor Costain Skanska Joint Venture and has been hailed as an ‘inspiration to the whole team’. Integrity award: Alicia Harfield, Infrastructure apprentice, Whitechapel station: With a real understanding of quality assurance, Alicia has been recognised by clients and co-workers as a role model, resolving any situation that comes her way with confidence and ease. Respect award: Daisy Hudson, Business Apprentice Level 3, Systemwide: Despite not having previous experience, Daisy has embraced her role with enthusiasm and dedication, and consistently demonstrates a respectful attitude and a dedication to customer service. Inspiration award: Jamie Ashman, Infrastructure Apprentice Level 3, Liverpool Street station: A diligent young engineer who delivers complex tasks with enthusiasm and integrity, Jamie has grown into a consummate professional who is always keen to learn and offer assistance to others. Collaboration award: Jessica Kirby, Business Apprentice, Systemwide: A young apprentice who has grown in her role to successfully manage multi-million pound projects with professionalism, openness and engagement with others. Crossrail has surpassed its target of creating 400 apprenticeships during the lifetime of the project, with over 657 recruited so far. The apprentices have been trained in a range of professions from civil engineering and construction to accountancy, quantity surveying and business administration. Since April 2009, Crossrail, Transport for London, London Transport Museum and their supply chains have created over 7,600 apprenticeships. The roles have enabled people to gain recognised qualifications, essential skills and valuable experience working on vital infrastructure projects across the Capital.